Livingston School Board Voted in Top 10 in State, AUSTIN, September 10, 2013 - Five school boards from across the state were selected as Honor School Boards in the Texas Association of School Administrators (TASA) annual School Board Awards Program. The school board awards program has recognized outstanding Texas school boards for their commitment to schoolchildren and their communities since 1971. The Honor Boards were selected by a committee of Texas school superintendents, chaired by James Ponce, superintendent of McAllen ISD, whose school board was named the Outstanding School Board in 2012. The selection committee’s decisions are based on specific criteria, including support for educational performance, support for educational improvement projects, commitment to a code of ethics, and maintenance of harmonious and supportive relationships among board members. "I commend each of these school boards for their leadership and teamwork to enact policies that support and foster ongoing improvements in their districts. It is clear that each of these finalists exhibited a strong commitment to their schools, students and community," said Ponce. REGIONAL WINNER -- Livingston School Board selected as Region 6 Outstanding School Board of the Year. 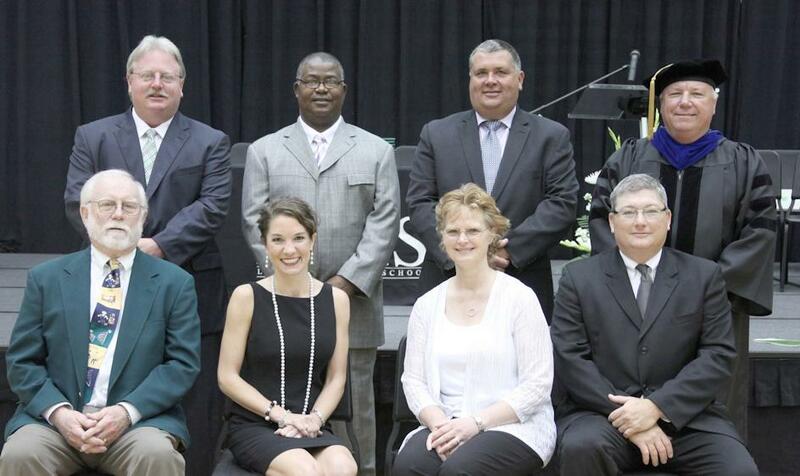 Board members are: (Front L-R): Henry O. Ager III, Casey Evans Davis, Bea Ellis, Ben Ogletree, III, (Back L-R): Jeff Galloway, Frank Henderson, Mike Nettles and Dr. Darrel Myers.